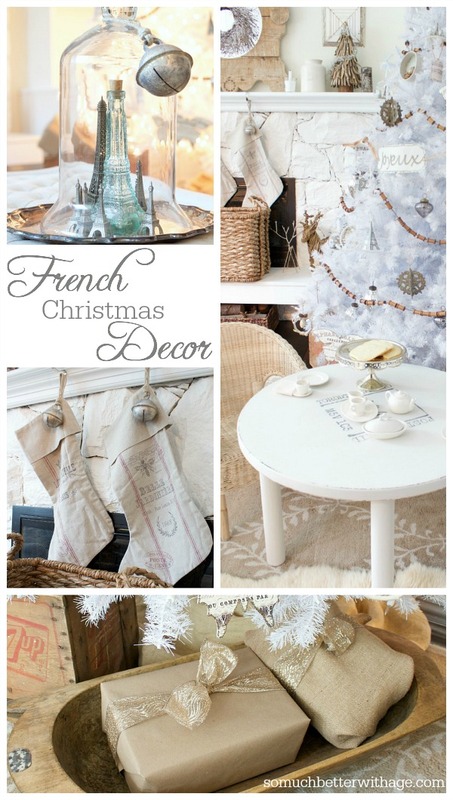 I used elegant French vintage decor to decorate my house this Christmas! 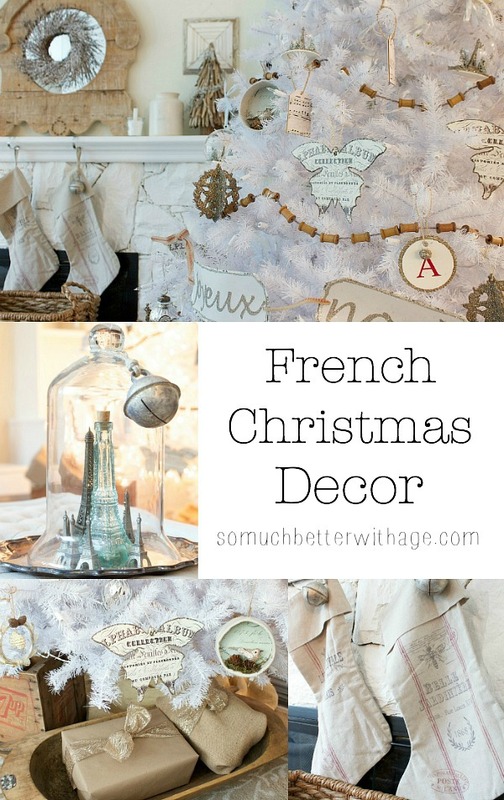 Well, I’m honoured to be among some of my favorite bloggers today to talk about French Christmas decor! I think by now you know how much I LOVE French and vintage decor. So when my friend Rachel from Maison de Pax asked me to join her on this blog tour, I couldn’t wait! Putting French Christmas decor together is seriously something I don’t have to think too hard about, it just naturally happens for me. 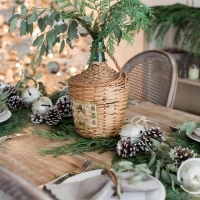 I just gravitate to the earthy, neutral tones, beautiful grain sacks, rustic woods, dough bowls, Eiffel towers. 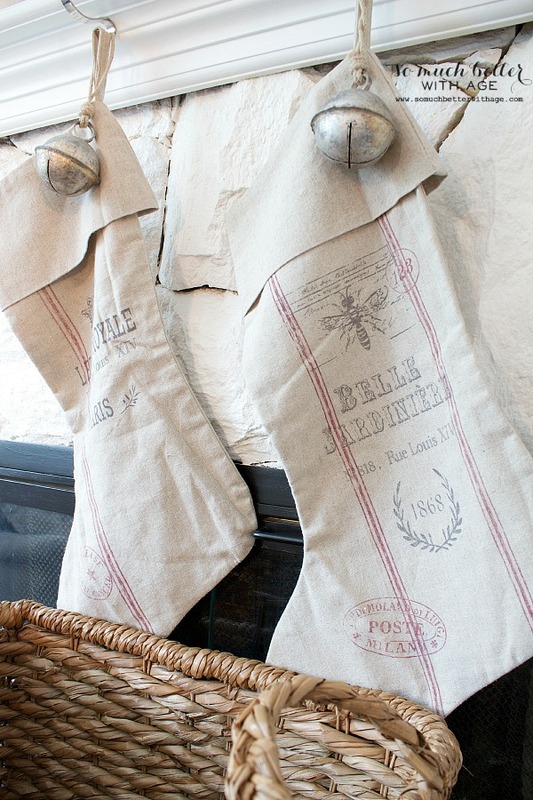 Let’s check out all my elegant French Christmas details, shall we? I just took part in Jennifer Rizzo’s Holiday Housewalk and I decked the halls! Now the fun part…more detailed photos. 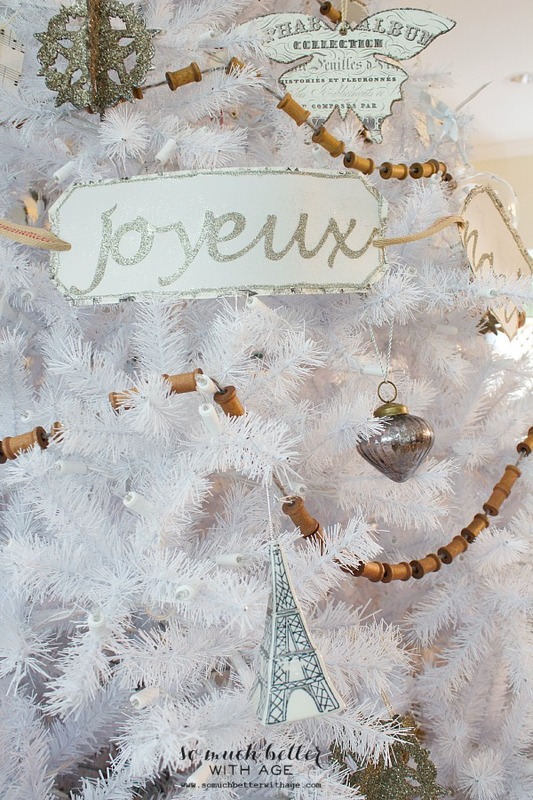 My living room has many French Christmas details as my living room is very French. 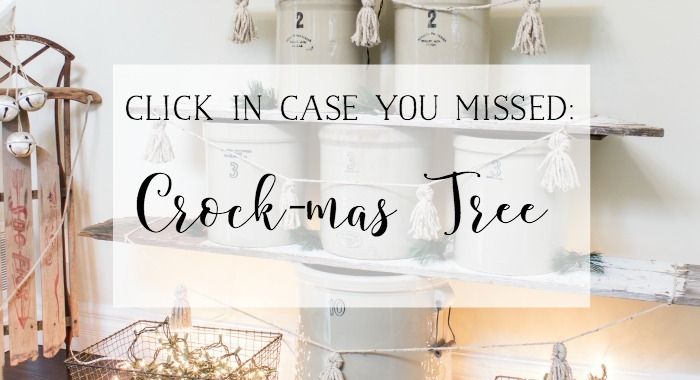 I love my new white tree (*affiliate link) from Balsam Hill. 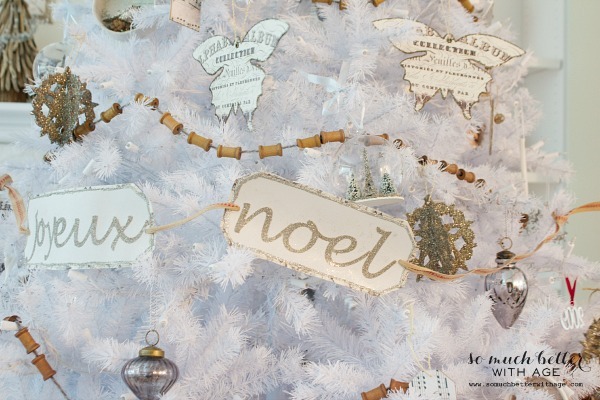 I recently made this ‘Joyeux Noel’ sign with my Silhouette machine. 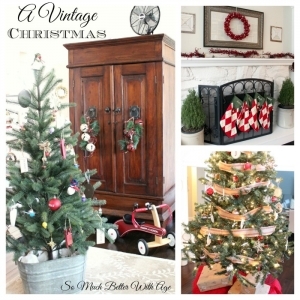 And I scored those Wendy Addison butterfly ornaments on sale from my favorite local store, Country Furniture. Same with the glittery spheres. 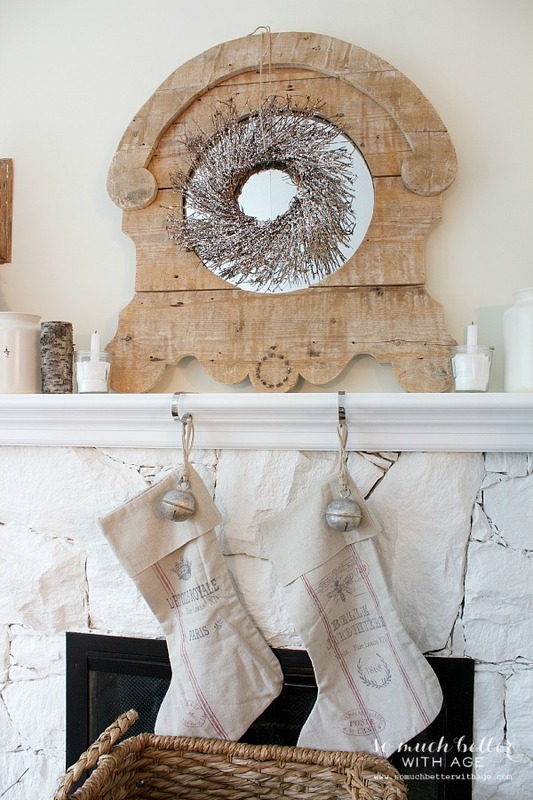 I also bought that rustic mirror from Country Furniture recently on sale (the mirror is cracked, still need to fix it) and the stockings I bought from there last year. I wish they still sold them! 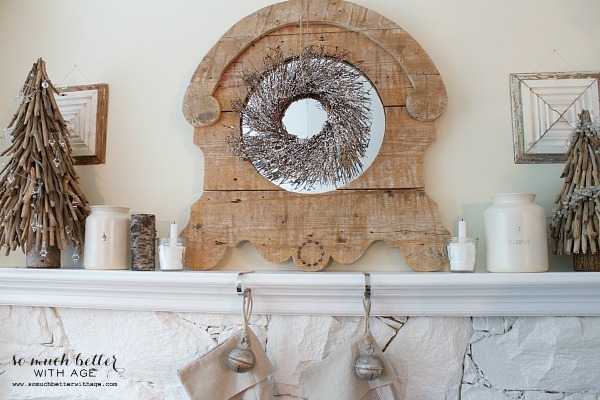 The flocked twig wreath is a Home Sense find from two years ago. I made my own crocks on the mantel recently. The twig trees I bought from Home Sense two or three years ago. 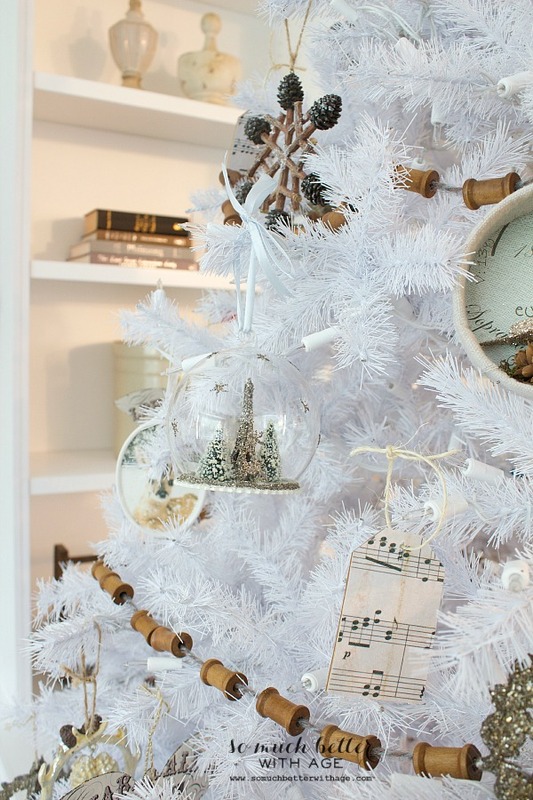 Those glass globe Eiffel tower ornaments are my FAVE! Also purchased from Country Furniture. 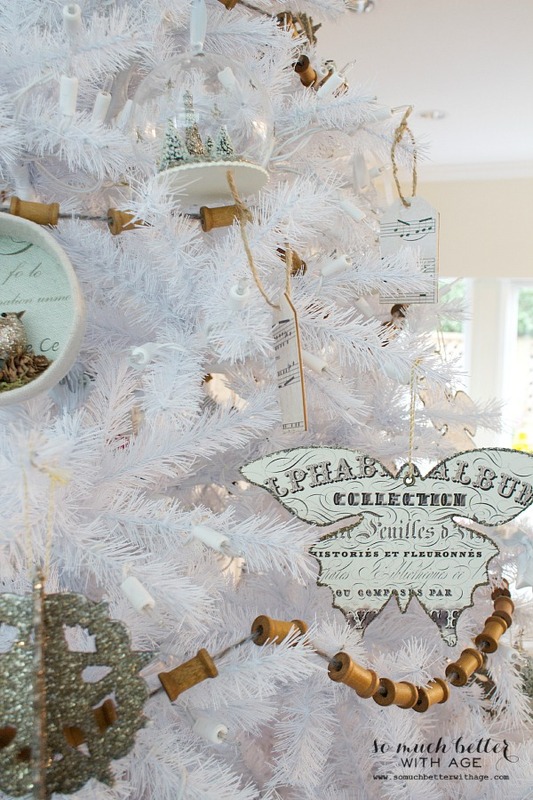 Oh and I can’t forget about my DIY sheet music wooden tag ornaments. An old dough bowl is very European. 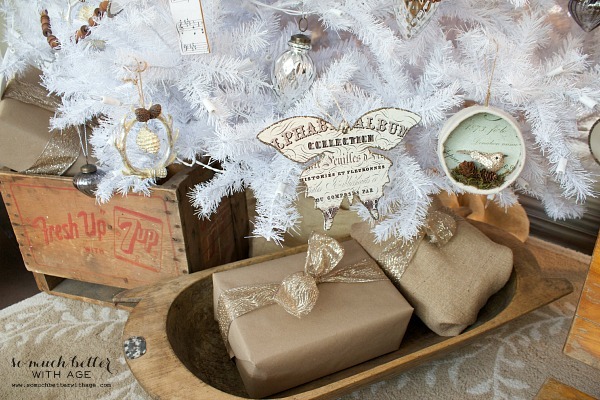 I’ve used that bowl and the 7-up crate in so many decor change-ups around the house. 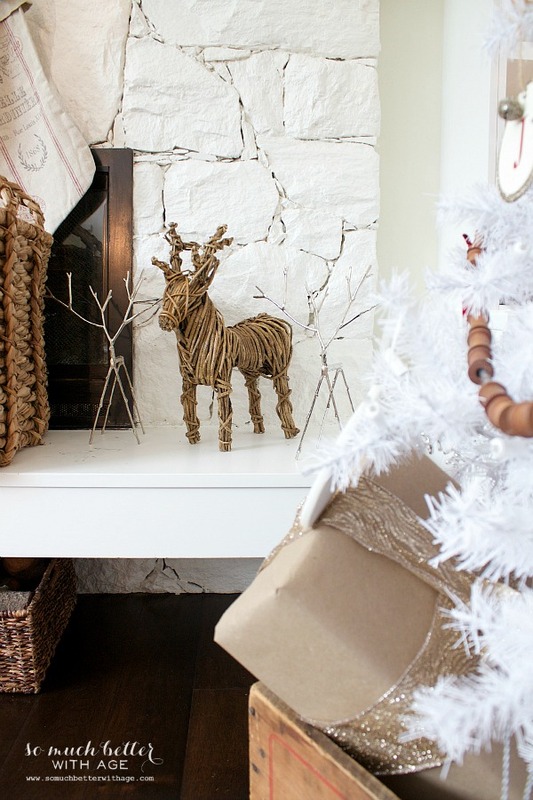 The metal twig reindeer are from Pottery Barn and the rustic reindeer is from Home Sense a few years back. 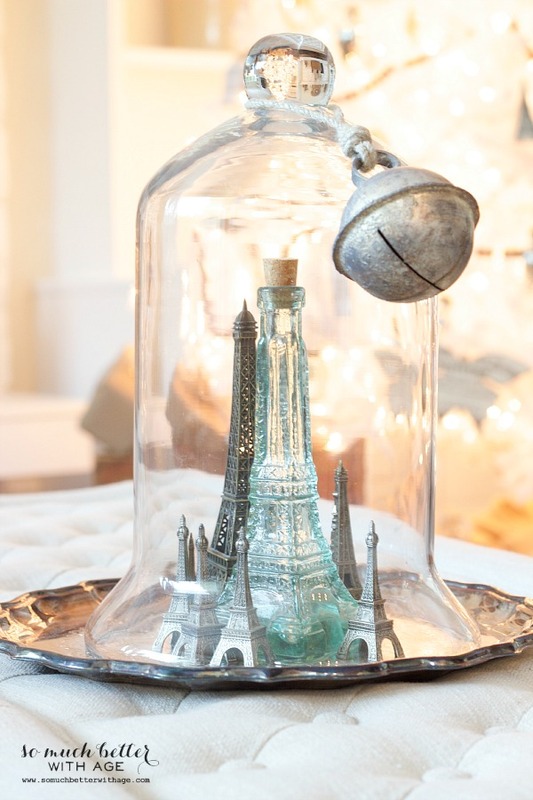 My little collection of Eiffel towers under a cloche on an old silver tray. 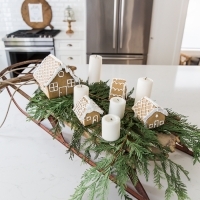 Next week I’m going to be sharing more on my Christmas kitchen. 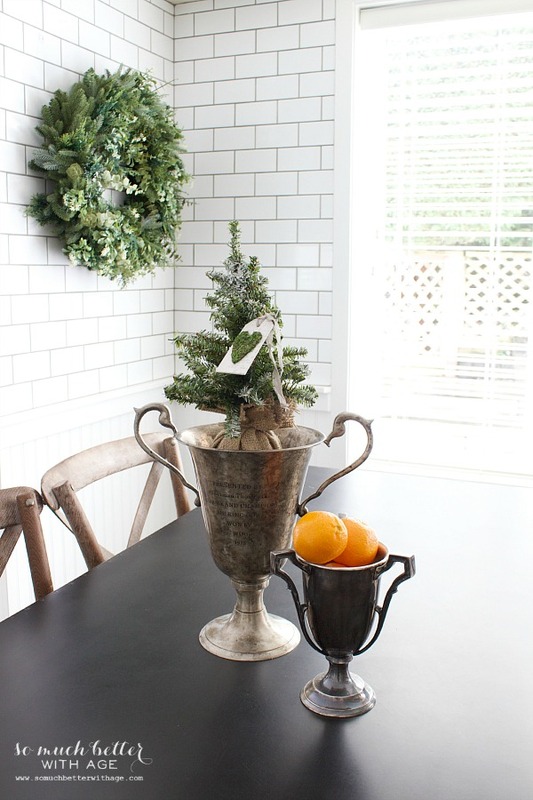 Now be sure to be inspired by more French-influenced Christmas decor from my friends below! The socks and the bobbins are GORGEOUS!!! Love it all, Jamie. 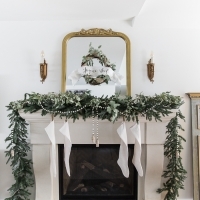 The spool garland is such a cute idea. Thrilled to party with you. 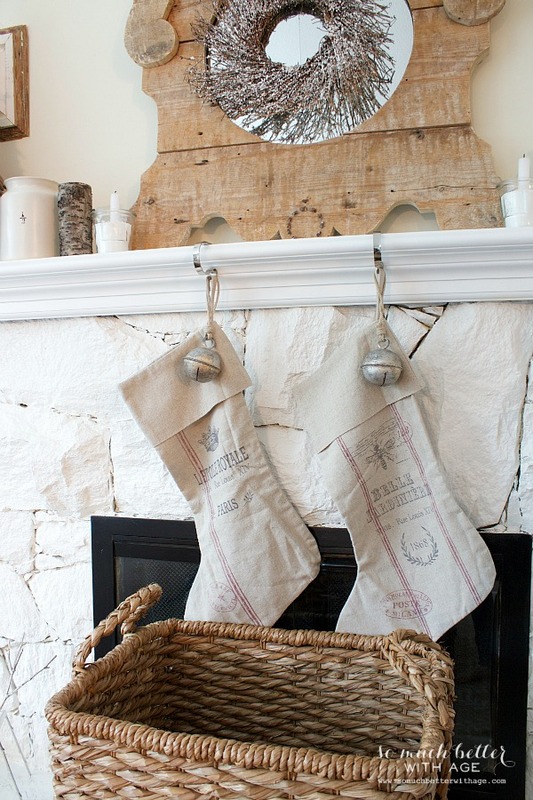 Love the blog tour of your home-your tree is a stunner and I love the reindeer on your hearth. Very Cozy! I’ve seen that white tree dozens of times now and it still gets me every time! Gorgeous! You have delighted this Francophile’s heart. 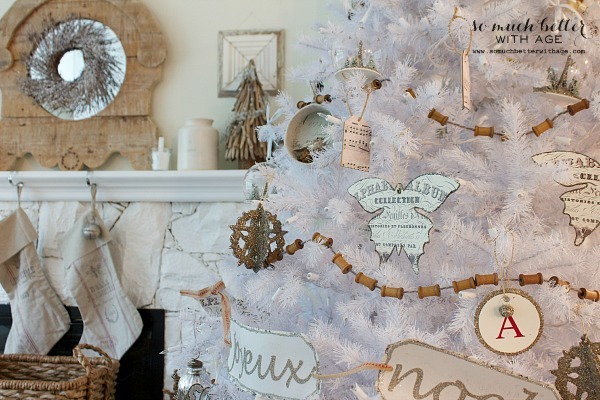 Your ornaments and creative touches are so beautifully executed. Merci for sharing. Beautiful, Jamie! 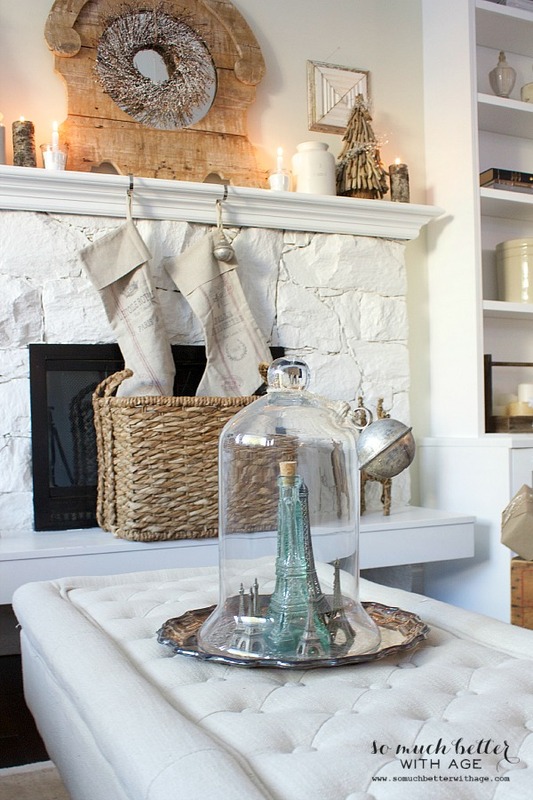 Your cloche with the Eiffel towers is especially calling my name. Thank you SO much for participating in this! Thank you so much for inviting me, Rachel! I loved being a part of it. Perfectly lovely Jamie!! You did a fabulous job. Magnifique! Mon ami! I adore your style Rachel!!! How do you do it all? 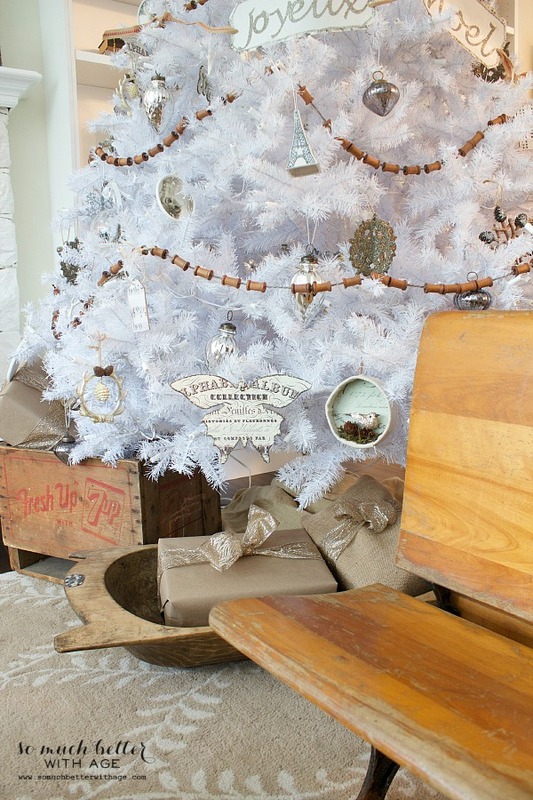 Your tree and living room is so French and dreamy! Thanks so much for including me in your “beau” tour!!! Calins et de basier (hugs and kisses)! Aww, thank you so much, Yvonne! Thank you so much, Lidy. I can’t find them anywhere either 🙁 I found them at a local shop years ago. Sorry!